In 1984, Fidel Castro spoke at the opening of the 21st paediatric congress in Cuba. This was 25 years after the triumph of the Revolution. The details in the speech are inspiring, an organised society, with a revolutionary leadership and vision of what can be achieved when human need and development rather than profit and greed are the driving force. In February 2012, Rock around the Blockade sent a solidarity brigade to Cuba, hosted by the Union of Young Communists. We visited a maternity home, a children’s cancer unit and met with a group of family doctors (equivalent to our GPs). Reviewing Fidel’s speech today in 2012 and reflecting on our experiences on the brigade, we can clearly see how Cuba’s healthcare system has been driven by Cuba’s socialist revolution. It is no coincidence that Cuba’s healthcare in renowned around the world. After the triumph of the Revolution, the health service, free for all, was extended to cover all the country. Training facilities and research centres for doctors, nurses and health professionals were rapidly expanded, antenatal care of mother and child and care of the child in their first year of life was built up and preventative health care and public health were prioritised. The results were impressive: By 1967 Cuba had wiped out malaria, polio by 1970, and diphtheria by 1971. By 1983 there were no cases of tetanus and the number of cases of whooping cough, measles and tuberculosis were dramatically reduced. By the time of Fidel’s 1984 speech, Cuba had reduced infant mortality from over 60 deaths in the first year of life per 1,000 live births to 15, saving the lives of 100,000 children. In addition Cuba had saved the lives of a further 70,000 children under 15 years of age by the dramatic reduction in deaths from diarrhoeal illnesses. This was all accomplished in the context of an ever tightening US blockade. Underpinning these achievements was the eradication of illiteracy and the rise in the education level of the population; as well as public health measures such as universal access to safe drinking water. Additionally, the role of the mass organisations has been vital in the battle for health. In 1984, the Cuban Women’s Federation had 60,000 delegations throughout Cuba, each with a voluntary health brigade worker, relating to the health programmes and the mass campaigns. The 85,000 Committees for the Defence of the Revolution (CDR, block committees in neighbourhoods) have also been key to organising health-related tasks such as vaccination programmes, as have the trade unions with their health delegates in all factories and work places. In 1981, Cuba experienced an epidemic of haemorrhagic dengue fever, which the CIA subsequently proudly admitted that they had deliberately introduced as bacterial sabotage against the people of Cuba. Starting in Havana in late May 1981, it spread to every province by mid-June, peaking in mid-July with over 10,000 cases per day. Thousands of dollars were needed for equipment and many thousands of people were mobilised to detect and eradicate the sources with crash courses for workers who played key roles in the campaign. Intensive care units were improvised in all hospitals, as well as turning some school buildings into temporary hospitals. In the end all cases were hospitalised to achieve total isolation. The last case was reported on 10 October. With tremendous efforts from doctors, nurses, scientists and the general population, mortality was kept down to 101 children and 57 adults. By 1984, Cuba had practically met all the goals of the ‘WHO Health for All in the year 2000’ programme. Up to today, Cuba continues to improve the health of their nation and collaborate internationally on a scale unmatched by any international aid agency or government. Whilst on the brigade, we met with family doctors in Guanabacoa, rural Havana Province. They explained how Cuba’s health system has been developed with increasing participation of the community and mass organisations. The family doctor and nurse programme was started in 1984 in Havana and was established in all provinces by the next year. Each family doctor unit live in the community they serve and are available 24 hours a day. Each unit is responsible for no more than 1,500 people each, whom they know them personally and visit in their homes. Care is put in the context of their family and social setting and there is great emphasis on preventative care and health promotion work. In a similar vein to Fidel Castro 28 years ago, Manuel Puentes, director of the polyclinic in La Rosita, Havana Province pointed out that ‘the community helps to solve health problems’. The family doctor and nurse rely on the mass organisations to tackle issues and disseminate information. They often meet with members of the CDR, local Communist Party members, the Women’s Federation building programmes together which link the family doctors and nurses with the community organisations. Control and eradication of dengue fever is still a priority. There are ‘sanitary brigades’ who back up the work of the healthcare professionals. Puentes explained that in Havana province since September 2011, there have been 72 dengue fever cases and two people hospitalised, despite concerted work to prevent its spread. Fumigation and information dissemination is a multidisciplinary issue involving mass organizations, community leaders and workplace delegates. Highlighting the collective responsibility, at the time of a dengue fever outbreak, some workers from factories, farms and businesses leave their jobs to participate in brigades exclusively dedicated to control and isolation of dengue. Manuel Puentes spent three years in Venezuela till 2006 helping to implement part of the Barrio Adentro programme. He told the brigadistas how he met people who had never seen a doctor and who couldn’t afford medical care. The conclusion he came to was that ‘the only social system that is closest to perfection in terms of health and human factors, is in Cuba’. The passage of the Health and Social Care Act in England in April is the latest and most destructive phase of over 20 years of internal market, fragmentation and privatisation of the National Health Service. The Camden Road Practice, a GP surgery in north London, closed in April because The Practice Plc, a company subcontracted by United Health UK (subsidiary of the large US health insurers) which has managed the surgery since 2008, have failed to find new premises, leaving 3,000 of the surgery’s 4,700 people without a GP. Richard Branson’s Virgin Care which has just signed a contract worth £500 million to take over the entire provider arm of NHS Surrey – a five year contract to run seven community hospitals, community nursing services, community dentistry, health visiting, prison health services and specialist services for physiotherapy, diabetes and renal care – for profit of course. 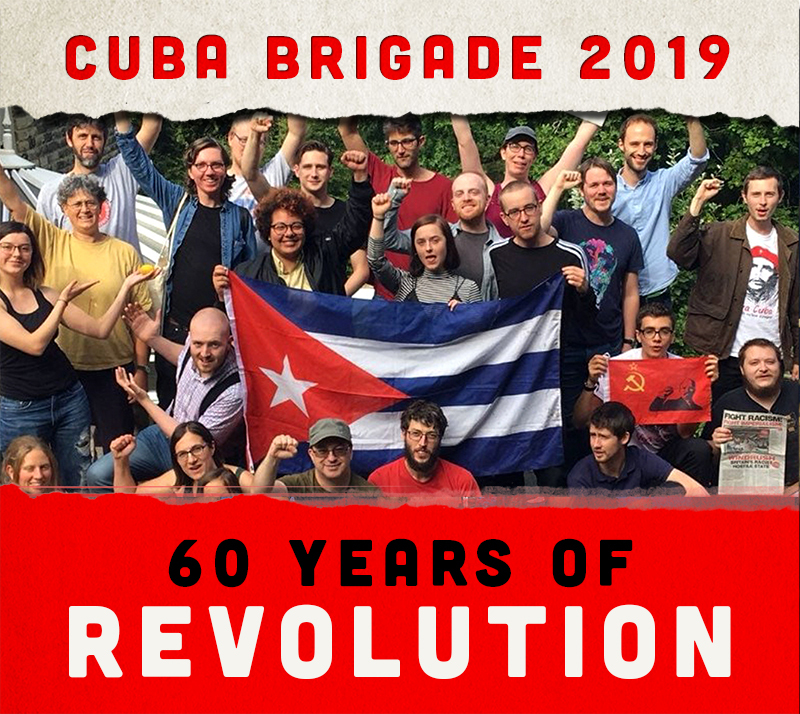 Part of our struggle to build a movement for socialism in the imperialist heartlands is fighting the silence and misinformation about socialist Cuba and its achievements. As we fight the privatisation of our health service, we must let people know what can be achieved when capitalism is overthrown, and healthcare is embedded in a society dedicated to building socialism.